Beautiful, rarely available, 3 bed, 2.5 bath in the amazing Monaco community of Torrey Highlands! Great Location with easy access to the 56 freeway, walking distance to Westview High, Torrey Meadows Neighborhood park, shops, restaurants, and more. Private backyard for entertaining! Freshly painted with many upgrades! 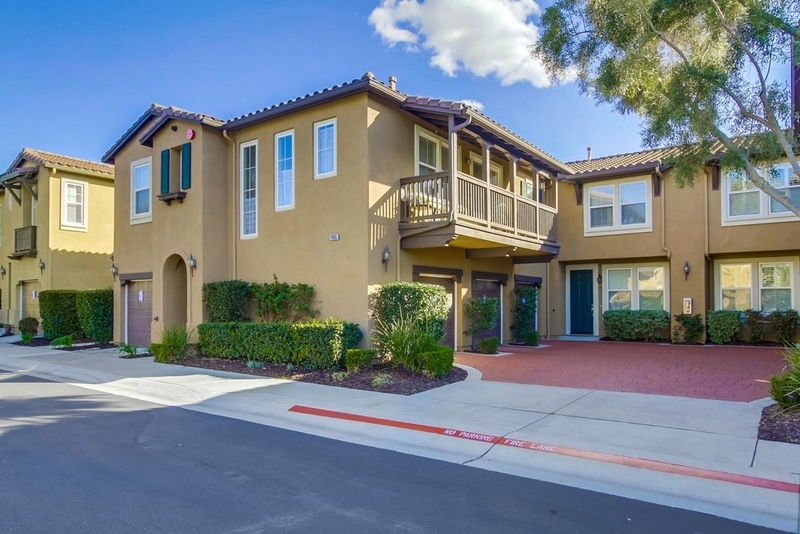 Move in ready condition!, Fall in love with this beautiful and private Torrey Highlands townhome in the Monaco community! Upon entering the home, you will immediately be greeted by ample amounts of natural light from surrounding windows in the living room and dining area. The living room also features a fireplace with gray mantle surround and adjacent white entertainment niche with shelving and cabinet storage. This room connects seamlessly to the dining area featuring more windows and a modern hanging chandelier. From here, there is easy access to the private backyard space where you will find a full paved patio as well as full fencing. The backyard area does not have any units behind it and backs up to a quiet greenbelt. Plenty of lush greenery and trees surround and multiple options for outdoor furniture and BBQ to enjoy the amazing San Diego climate! Back inside, this chef's kitchen features white cabinetry throughout, gas burning range, and TONS of countertop space which makes entertaining and cooking a breeze! Enjoy the quaint breakfast area with large window facing outside to bring in more natural light and provides a great place to enjoy your morning coffee. This entire first floor also has beautiful laminate flooring throughout for a clean, modern look! Upstairs you'll find the private Master Retreat with large, bright windows, master bath with dual sink vanity featuring white countertops and vanity, shower/tub combo, and master closet! Down the hall are 2 additional spacious bedrooms with full closets and a second bathroom. Upstairs laundry room also features extra cabinet storage for more organization. Additional features of this home include downstairs half bath, Nest thermostat, Nest smoke detector system, attached 2 car garage with storage capabilities, and plenty of cabinet/closet storage throughout! This townhome is in a highly-sought after area and is just walking distance to the community pool for residents. Torrey Meadows Neighborhood Park is within walking distance featuring a playground and outdoor covered seating! Additionally, enjoy the award-winning Poway Unified Schools within 4 miles including Westview High just 1 mile away! You are also walking distance to food and shopping- coffee shops, grocery stores, restaurants, and gas are all within 1 mile! Endless amounts of cuisine options featuring 131 restaurants within 5 miles. Lastly, enjoy the great outdoors of San Diego with the 23 local golf courses and 22 parks within 10 miles of your home. Hop on CA-56 to take you straight to Torrey Pines State Beach, Del Mar Beach and more coastal beaches in 10 minutes! Brought to you by the Butler Gore Realty Group.